Below is a guest post by Lisa May describing her latest paper, “Enhancement of Meditation Analgesia by Opioid Antagonist in Experienced Meditators”, which is now out in Psychosomatic Medicine. People who practice meditation for a long time get pain relief from meditation, but scientists don’t yet understand how the brain creates this pain relief. I ran a study to test whether meditation reduces pain by using the brain’s natural morphine, endogenous opioids. I thought that endogenous opioids might cause meditation pain relief because other forms of psychological pain relief, such as placebo effects, rely on endogenous opioids. I tested this idea by examining the effects of meditation on pain while endogenous opioids were turned on and again while they were turned off. If the pain relief people get when they meditate goes away when endogenous opioids are off, then I could infer that opioids cause meditation pain relief. That is what I thought would happen. To test this idea, I worked with 32 healthy adults who had a long-standing meditation practice. These meditators were kind enough to let me deliver short bursts of pain to their hands, and then they reported their pain levels. We repeated the pain before and during meditation. Most of the people in my study (85%) felt less pain while they were meditating than when they were not. This same group of meditators then did two more days of testing comparing their pain before and during meditation, but with a twist. On one day, I gave them a drug called Naloxone that blocks the brain’s ability to use opioids, meaning that the meditators couldn’t feel the effects of their natural morphine for a couple hours. On the other day, I gave them saline as a control because saline has no effect on how the brain processes pain. They didn’t know which day they got which drug, and I didn’t either. Because Naloxone turns off the effects of endogenous opioids, I figured it would to one of two things. Naloxone could turn off pain relief during meditation, indicating that opioids cause meditation pain relief. Or, Naloxone could have no effect on people’s pain, indicating that meditation pain relief is caused by some other neurotransmitter. This drug has been used in a lot of pain research studies, and one of those two things always happens – either pain relief goes away, or there is no change in pain. However, I found something totally new and surprising. 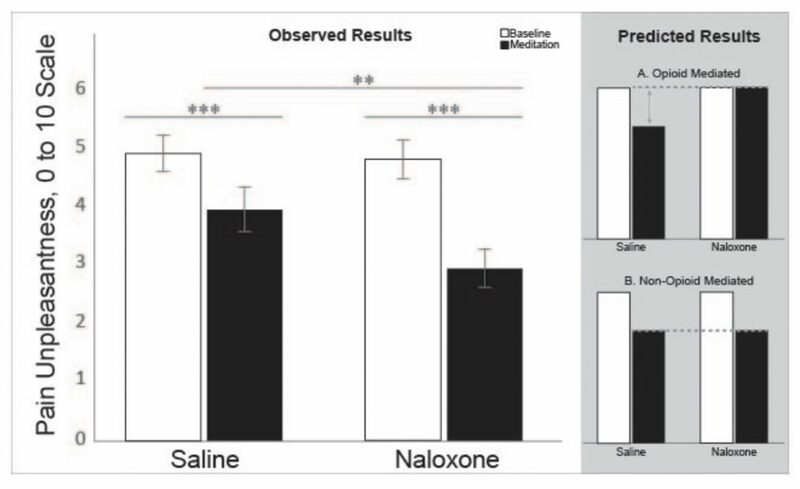 Naloxone made the pain relief during meditation stronger! The actual results are shown in the figure below. This is the first time that a high dose of Naloxone has made pain relief stronger in a research study. What does this finding mean? First, it shows that meditation pain relief does not rely on endogenous opioids. The results also suggest that studying meditation could teach us important things about how the brain processes pain. Finally, we need to do more research to fully understand why turning off endogenous opioids made pain relief stronger. This study might teach us more about how to relieve pain without opioids. This entry was posted in News and tagged papers, pop abstracts, research. Bookmark the permalink.